Hornsund. Click on the yellow areas to view photo galleries of the individual areas. General: The most beautiful fjord in Spitsbergen (as Bellsund, Isfjord, St. Jonsfjord, Kongsfjord, Smeerenburgfjord, Liefdefjord etc. 🙂 ) and definitely the southernmost one. Great scenery! If the weather allows for some good views, that is. Hornsund cuts approximately 25 kilometres deep into the island. One of many calving glacier fronts in the Hornsund. Because of the topography, there are relatively few landing sites, but just cruising through the Hornsund can be amazing – provided the weather doesn’t screw things up. 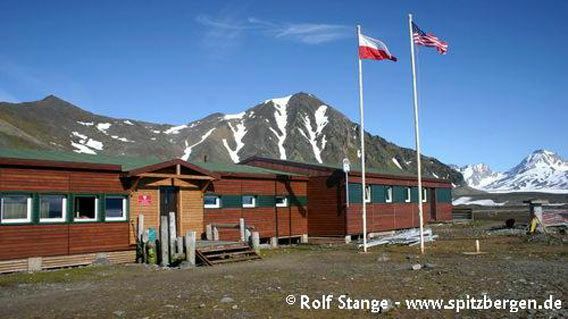 The Polish station is the only research station outside the settlements; it is remarkable, that Poland has kept its station, whilst other countries have abandoned theirs – Sweden with Kinnvika on Nordaustland, The Netherlands with Kapp Lee on Edgeøya. There is not an awful lot of tundra, but at some spots, the vegetation can be very rich and colourful. This is partly due to fertilization by very large Little auk colonies. There is a number of interesting cultural monuments. Seemingly paradox, there is more drift ice in the Hornsund than further north at the west coast. This is due to a cold current which comes from the northeast on the eastern side of Svalbard and then around the south cape and up the west coast. It brings a lot of ice to the southern part of the west coast, so the Hornsund is usually blocked with ice in the early summer, even if the other fjords further north are already ice-free. 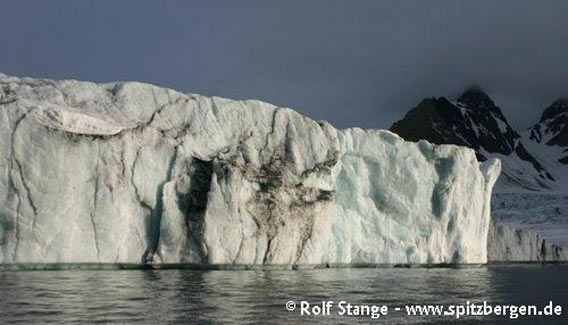 It also brings a lot of cold, polar watermasses into the Hornsund, which stays in the inner part of the fjord, thus providing a high-polar marine ecosystem in direct neighbourhood to the more subarctic waters influenced by the gulf stream. This provides for an interesting faunal cross-section from subarctic to high arctic within a small area, an interesting field of work for scientists. 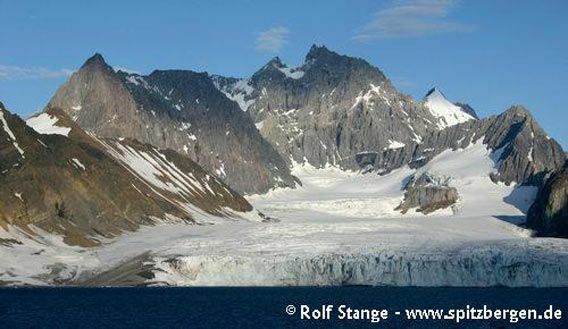 The Hornsund area is part of the South Spitsbergen National Park. Geology: Varied. 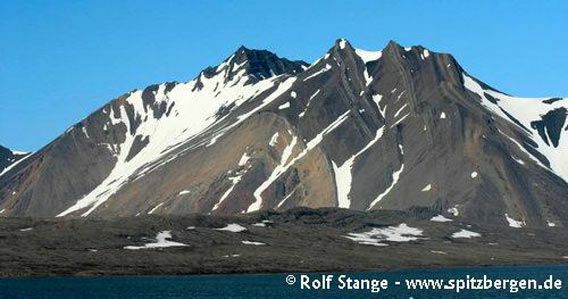 The Hornsund offers a relatively representative cross section through the geology of Svalbard, similar to the Bellsund. 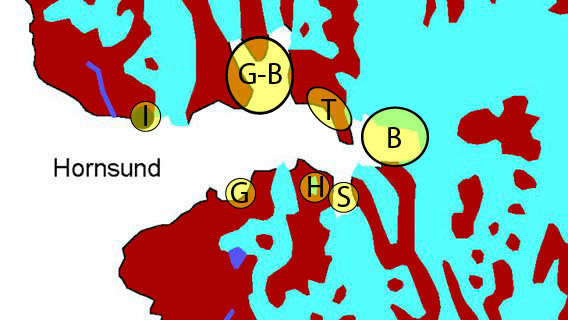 In comparison, the stratigraphy is more complete in the Hornsund, as the Devonian Old Red is present here, and the basement is cropping out in a larger area, from the west coast into central parts of the fjord. The Hornsundtind consists of crystalline basement carbonates (upper Proterozoic). Otherwise, the basement in the Hornsund area is dominated by weakly to medium metamorphosed sediments (additionally to various carbonates, there are schists, phyllites, quarzites etc.). Magmatic rocks play only a very subordinate role, as opposed to the basement in northern Svalbard. The sedimentary cover rocks start on the eastern side of Burgerbukta and Samarinvågen. On the northern side, it starts with Devonian conglomerates and sandstones (‘Old Red’), followed by the prominent Kapp Starostin Formation with its hard, fossil-rich limestones. They are dipping vertically, similar to the situation in the Bellsund, forming conspicuous peninsula (Treskelen) and mountains. Bautaen is quite spectacular: grinded down by glacial erosion from both sides, it looks as a needle, if you look from the right perspective, and is thus almost as striking as Hornsundtind with its 1429 m, despite its lower height. A very nice section can be seen on the eastern side of Burgerbukta, where the lower slopes expose Devonian Old Red, overlain by dark Triassic sediments and finally topped by the yellowish-brown Permian carbonates, to which the Kapp Starostin Formation belongs – and, to make this all even better, nicely folded as an anticline (large fold, central part is bent up or ‘against’ (‘anti’) the sky). Hyrnefjellet east of Burgerbukta with nice anticline (which means that the layers are bent upwards). The lowermost layer (just below image centre) Devonian Old Red, then light-brown Carboniferous and mainly Permian carbonates finally followed by dark Mesozoic sediments. Similarly to the situation further north in the Bellsund, the deformation of the rocks is striking. Tectonic activity during the opening of the north Atlantic took place west of the west coast (well, makes sense, as that’s where the Atlantic is). The nearer to the coast, the stronger are uplift and deformation of the rocks. Close to the coast, uplift was strong enough to expose the basement, which is buried under several kilometres of sedimentary cover in central Spitsbergen. Close to the basement, the sedimentary cover rocks are strongly deformed and dip vertically with a N-S trend and expose nice folds and faults (east of Burgerbukta, Treskelen, Bautaen). Further to the east, where the sediments have preserved their original, horizontal position, you find the classical plateau-shaped mountains; this is the case east of Brepollen, the innermost part of the Hornsund. Plateau-shaped mountains composed of nearly horizontal sediment layers east of the Hornsund. Landscape: Spectacular. The outer coast north and south of Hornsund features large coastal plains. The first mountain chain is relatively ice-free, there are some larger, partly ice-free valleys such as Gåshamna, where you can find very nice frost-patterned ground. The central and inner parts of the Hornsund are strongly glaciated, so there are almost no tundra areas there. There are almost vertical rockwalls and wild mountains around Burgerbukta and Samarinvågen. West of Samarinvågen, the mighty Hornsundtind is towering over the fjord with its 1429 metres, but you need quite a bit of luck with the weather to see it form tip to toe. There are glaciers calving into all side bays, so there is often a lot of ice on the water; icebergs, growlers and bergy bits, as the whalers used to call small pieces of ice. Brepollen, the innermost part of the Hornsund, is almost completely surrounded with glaciers. Because of the general, well-known retreat of glaciers also in Spitsbergen, which is very pronounced in Brepollen, there are more and more moraines visible at the coast, to a larger degree than indicated on the scetch map above. Flora and Fauna: Because of the topography, there are few tundra areas, but the vegetation can be very colourful near bird colonies. Here, you can find reindeer, fox, geese etc. The Hornsund is well-known for its large colonies of Little auks, there are hundreds of thousands of them breeding in the Hornsund; most of Svalbard’s Little auks breed either here or in the northwest of Spitsbergen. Little auks breed under large bolders, which means that you can’t see the nest itself. The breeding sites are ususally inaccessible due to the steep and rocky terrain, and in other locations such as near the Polish station, there are sometimes research projects going on, which means these sites can be off limits for tourists. 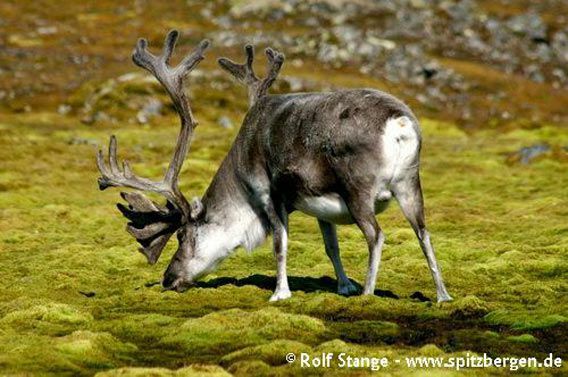 Reindeer enjoying rich vegetation under a colony of Little Auks in Hornsund. History: Long and quite interesting. Similar to the Bellsund, it was amongst the first fjords which was discovered by whalers in the 17th century. The Hornsund got its name from Jonas Poole, an English whaler, after some of his men had found a piece of reindeer antler there. 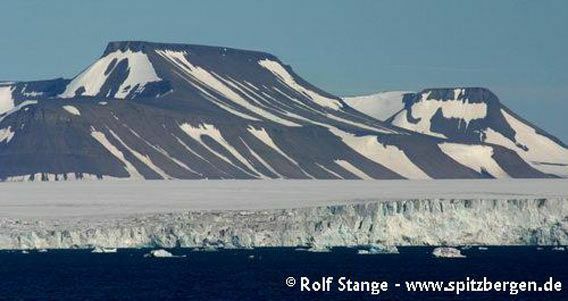 It is possible that Poole believed that the Hornsund was actually a strait through which it was possible to sail to the east coast of Spitsbergen, so he called it ‘Horne Sound’ and not ‘Horne Bay’ or similar. There are remains of blubber ovns and graves visible at several locations. Also the Pomors have used the Hornsund for hunting purposes. Whaler’s (or pomor’s) grave at Gnålodden, Hornsund. Amongst the expeditions which have visited Hornsund, for example the one of the Austrian-Hungarian Count Hans Wilczek in 1872 can be mentioned. Wilczek was an important sponsor of polar expeditions such as the ‘Tegethoff’ expedition with Karl Weyprecht and Julius Payer, during which Franz Josef Land was discovered. The bay Isbjørnhamna on the northern side of the Hornsund is named after Wilczek’s ship, the ‘Isbjørn’, which Wilczek used to accompany the ‘Tegethoff’ for a while in the Barents Sea. 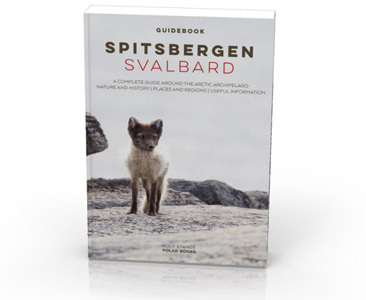 After they had separated near Novaya Zemlya, Wilczek sailed further to Spitsbergen and visited Hornsund. Also Wilczekodden on the west side of Isbjørnhamna is named after him, as is Hansbreen further to the east. The Swedish-Russian Arc-de-Meridian expedition (1899-1904) had one of their main quarters in Gåshamna. 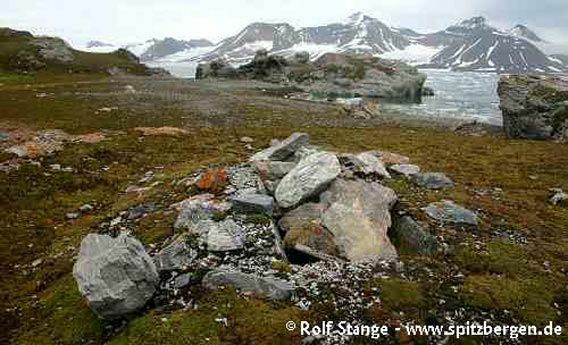 Hornsund was known amongst trappers as an excellent hunting area for polar bears. It was accordingly frequently used for winterings in the first half of the 20th century. One of the more famous figures of those times was Wanny Woldstad, a woman from north Norway who spent several years in Hornsund in the 1930s. She did not just keep the house tidy while her partner was out hunting, but she went out and did all the hard and dangerous work herself. Brave anyway, and certainly in the context of the 1930s in Norway. Sometimes she took her two sons with her for the wintering, who were in their teenage years. 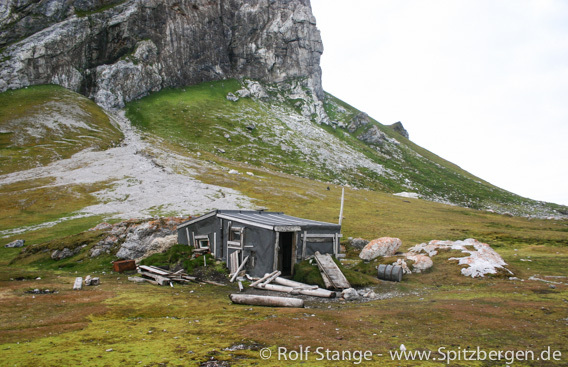 Trappers’ hut in Hyttevika, used by Wanny Woldstad and others. The old trappers’ hut at Gnålodden. Poland established a station in Isbjørnhamna during the International Polar Year 1957-58. 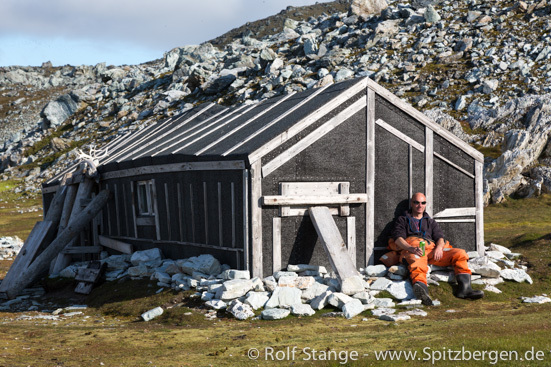 The station was kept beyond the polar year and, after a while, it was staffed year-round, so since the early seventies, there are constantly scientists in the Hornsund. During the winter, the crew is reduced to a core team, whereas in the summer there are often guest scientists from different nations. During the years of the iron curtain, the station in the Hornsund was a very valuable platform for polish scientists also to get in touch with western colleagues. Amongst the most important tasks of any polar station are long-term standard measurements within meteorology, Earth magnetism, seismology, northern lights etc. Additionally, there are different projects within certain, limited timeframes. Whereas the focus used to be on geomorphology and geology for a long time, nowadays glaciology has become very important; glacier studies, among others to understand the relationship between glaciers and climate change. The nearby Little auk colony makes zoology and arctic ecology an obvious field of study, and so do the interesting oceanographic mosaic of the Hornsund (see ‘general’ section). Polish research station in Hornsund. 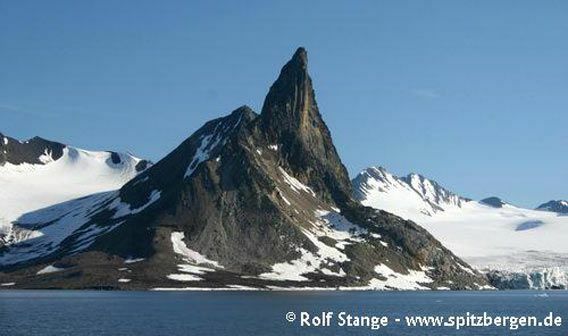 The first successful ascent of Hornsundtind (1429 m) was achieved by the German climbing expedition of Dr. Rieche in 1938. Hornsundtind is technically much more demanding than the higher mountains of northeastern Spitsbergen in the Atomfjella area, the highest one being Newtontoppen (1713 m).